Tree House Day Nursery Child Care and Pre – School- » 2018 Graduation! 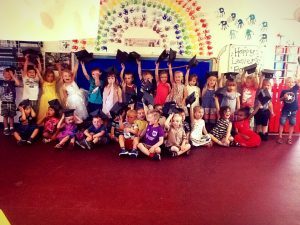 On Tuesday the 24th of July, we had our Pre-School leavers party and graduation ceremony! We had a wonderful entertainer – Professor Paradox, a party tea, party games and a graduation, complete with mortarboards! We wanted to wish all of our school leavers the best of luck at School! You will be very missed!